Guess what!? I made it to Day 30 of the 30 Day Shred yesterday! While I didn’t “shred” every single day for the last 30 days, I still stuck with it almost every day and am happy to done so! Read about the 30 Days HERE. Nothing terribly exciting on the food front lately. 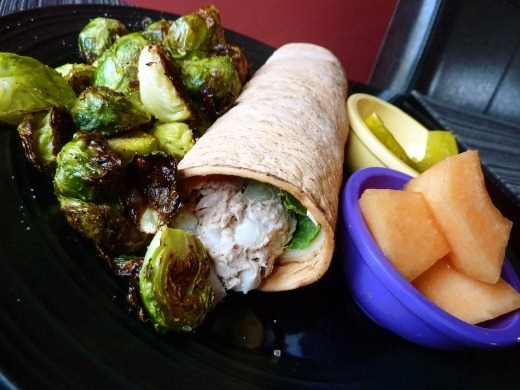 Tonight for dinner I mixed canned tuna with Miracle Whip, spicy brown mustard, and chopped onion and served it in a Sundried Tomato Flatout Wrap, along with a side of roasted brussels sprouts. Roasted brussels sprouts are Oh-So-Good! All you sprouts-haters should really give them a try. I also had a pickle spear, for kicks, and some melon with dinner. 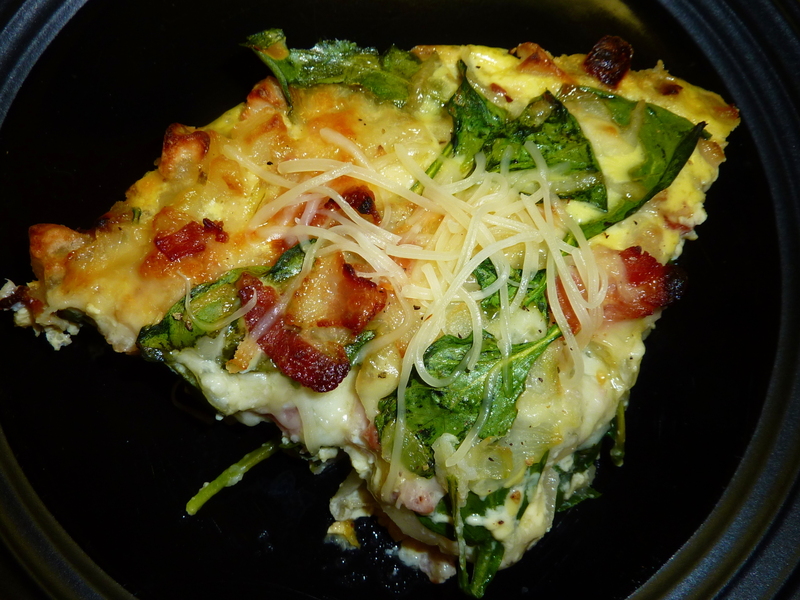 Yesterday for dinner I made one of my favorite tried and true recipes, Spinach & Bacon Hash Brown Quiche. Really good, but it really just takes way too long for a work night. In the future I will stick to making this guy on the weekends. Currently listening to: I Got Mine – The Black Keys. Did you make it through all three levels? The third level just destroys me. Last time I did it, I skipped workouts for like a week afterwards. I did! I did level 1 for 10 days, level 2 for 10 days (the worst! ), and level 3 for 10 days, though I had about 5 off days total throughout the 30 days, so each one was not done 10 times. Pingback: Flatout Wrap Bacon Pepper Pizzas « Meg.Goes.Nom.Nom. Pingback: Chili Corn Chip Pie | Meg.Goes.Nom.Nom.